Your smile is important to you - after all, it’s one of the first things that others notice when meeting you, according to recent surveys. To help you make the best first impression, Homer Glen dentist Dr. Alan R. DeAngelo offers a variety of cosmetic dentistry solutions. Among these beneficial services, professional-grade teeth whitening is one of our most popular. 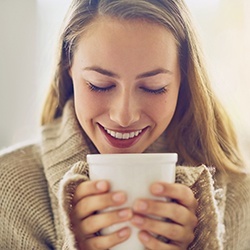 The dental office of Dr. DeAngelo offers in-office and at-home teeth whitening treatments to create your brilliant smile, so call us today to schedule your appointment at our Homer Glen practice! Should I Use In-Office or At-Home Teeth Whitening? It all depends on your personal goals for teeth whitening! Our Homer Glen staff uses Zoom! Whitening for in-office teeth whitening. Zoom! Whitening has been shown in clinical trials to effectively erase deep-rooted stains in enamel to lighten teeth by as much as eight shades. In-office teeth whitening only takes about an hour and you’ll emerge from Dr. DeAngelo's dental office with a shining white smile. This option is best if you want to immediately see the results of your cosmetic service at our Homer Glen location or if you want your teeth brighter for a social event, such as a wedding! Dr. DeAngelo is happy to help his patients feel and look beautiful. However, if you would like to gradually whiten your smile, Dr. DeAngelo can recommend our at-home whitening system. 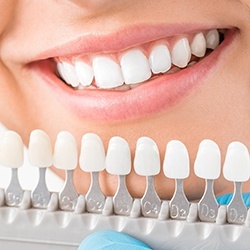 A member of our Homer Glen team will fit you for a customized whitening tray and provide a prescription whitening gel. On your own time, you’ll load the gel into the trays and wear them for the prescribed amount of time. You’ll reach your optimum whitening level in about two weeks. You can also use this at-home care to upkeep the brilliant results of your in-office Zoom! treatment. If you have any questions about your at-home system, feel free to call our office.